Mailing sounds like the most basic of tasks and if all you are doing is sending out 10 to 15 letters in an envelope then it is. But when the quantity becomes very high or the objects you are sending are large or bulky then this is where Morgan Printing becomes your best option. Not only can we provide a fast and professional mailing service, but in many cases we can do so while actually saving you money! 1) We print your letters on your letterhead where required, saving you a great deal of money in toner and paper cost. 2) You provide us with the client list and we set up the mail merge for you, saving you a great deal of time, money and most of all, frustration! 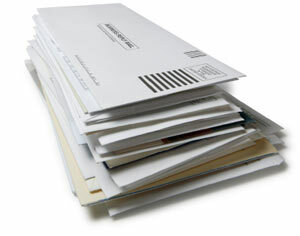 3) We insert the letters into envelopes, again saving you time and money and allowing your staff to be more productive. When added together, these benefits will often far exceed the cost of our services. So if you send out large or regular quantities of letters or other materials then contact Morgan Printing today for more details on how we can improve efficiency and save you money!